Can I Get a Master’s In That? | ¡Marianísima! Can I Get a Master’s In That? Two weekends ago, I saw my cousins for the first time in ages. They were visiting Dad in Daly City on a rare hot weekend, so drinking and conversation turned to beer. 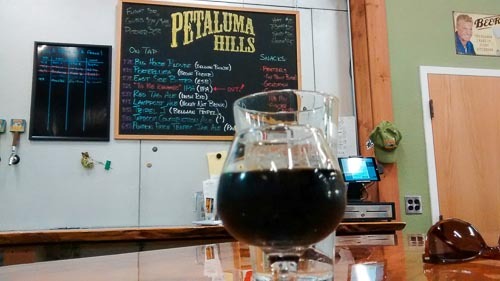 I told them Petaluma’s vying to become the epicenter of Northern California microbrewing and every little restaurant in town has several local beers on tap. Mostly, I was trying to ensure that their next trip is longer and includes a stay up here. The day after they left, I texted this picture to Tony. I’d told him Porterluma is my favorite local beer and how we’d been eagerly awaiting the opening of the Petaluma Hills Tap Room ever since we’d first tasted Porterluma in a beer-tasting class. Now that we’ve finally made it to the tap room, I can also recommend the red tag ale and the ESB (we did tastes instead of pints to maximize variety). The shiny new bar overlooks the brewing area, so we watched the beer making instead of the TV. The owner is friendly and answered my geeky questions about harvesting yeast. I can remember when my only question about beer was “Why do you drink that?” I also remember the first time I thought beer was good. I was about 18 and on a whitewater-rafting trip with my friend’s dad, acting as his adopted daughter for the weekend. It was sweltering hot, and I was parched. The sodas were in a cooler on another boat. I asked for a diet coke, and someone sent one flying through the air. I caught it, but it slipped through my wet hands and sunk to the bottom of the American River. Of course, that was the last soda available. It was 100+ degrees, and the beer was cold, wet and therefore delicious. My friend’s dad floated by in the other boat and gave me a sideways glance as I drank my beer, and I shrugged and told him there was nothing else to drink. (Bottled water hadn’t been invented yet.) For a long time after that, I thought beer was only good if it’s really hot outside. What I didn’t realize is I wasn’t drinking good beer. As I got older, I discovered beers I like even when I’m not dying of thirst. I’ve enjoyed beer while traveling and found “What’s a good local beer?” a fun question to ask. That was only the beginning of my questions. I wanted to learn more: the difference between ales and lagers; how various styles are made; etc. Basically, I wanted to go into a pub with multiple taps and be able to choose confidently. I’d wanted to take Beer 101 for years, but didn’t find an extended ed class until we moved to Petaluma. Once a week for several weeks, we sat in a community college chem lab drinking beers of different styles, learning about brewing processes, taking notes, and enjoying beer. Best chem lab experience ever! It taught me that I’ve still got a lot to learn, but I don’t have to travel far from home to continue my education.